Welcome Homo luzonensis. 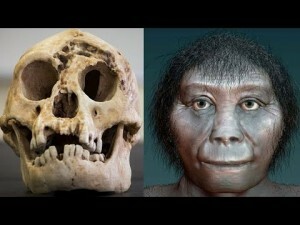 This is one of the most significant prehuman fossil finds since the discovery of Homo floresiensis in 2003. This news could even have a long term impact on the understanding of and search for Orang Pendek, within the worlds of hominology and cryptozoology. illustrator Harry Trumbore (rev. ed. San Antonio: Anomalist, 2006). Rocking the world of paleoanthropology through the findings published in Nature on April 10, 2019, is the discovery of a new species of fossil hominin. 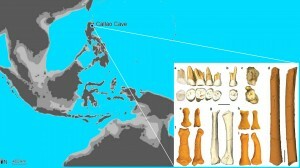 Fossils unearthed at Callao Cave, on the northern island of Luzon, Philippines, date to at least 50,000 years old. The team, led by Florent Détroit of the National Museum of Natural History in Paris, have named the new species Homo luzonensis after the island where it lived. The bones found constituted three individuals. 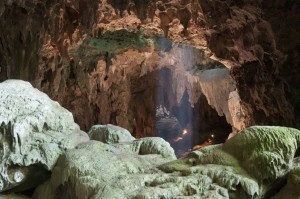 The fossils of Homo luzonensis were recovered from Callao Cave, Luzon, in the Philippines. An artist’s speculative impression of the adolescent offspring of a Neanderthal-Denisovan mating. 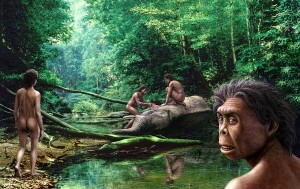 Homo luzonensis is the fourth unique and extinct human discovered in the 21st century. Homo floresiensis, so small it was nicknamed “the hobbit,” was found in Indonesia in 2003. Mysterious Denisovans, identified as a species based on a finger bone in 2010, lived in Siberia. Other Denisovan findings followed. Homo naledi skeletons, with admixtures of modern and primitive features, were pulled out of an African cave in 2013. 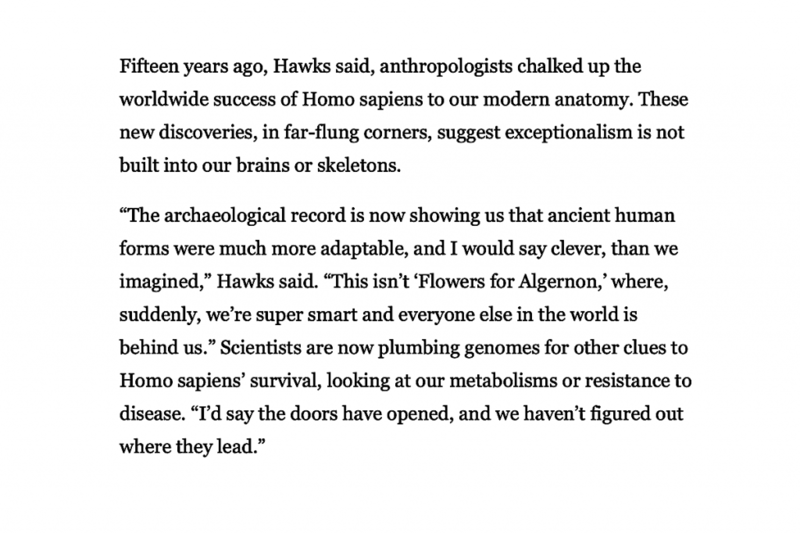 Others have disagreed with Hawks sense of how big Homo luzonensis was. The body parts are diminutive, suggesting Homo luzonensis grew no more than 4 feet tall. Its molars have modern shapes, but one molar has three roots, like Homo erectus. The way its leg muscle attached to its thigh bone is “distinctively human,” paleoanthropologist Rick Potts, who directs the Smithsonian’s Human Origins Program, has suggested. 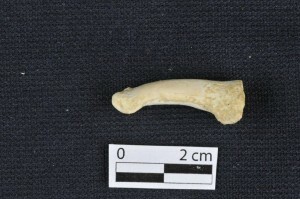 In 2007, Armand Mijares, an archaeologist at the University of Philippines, asked his colleague Australia National University zooarchaeologist Philip Piper to examine animal bones Mijares dug out of Callao Cave in Luzon. The bones in its hands and feet are curved, “spitting images” of the toes and finger bones that belonged to the very ancient Australopithecus, Piper said. These hominids, such as the 3-million-year-old Australopithecus afarensis Lucy, had digits well-suited for climbing. 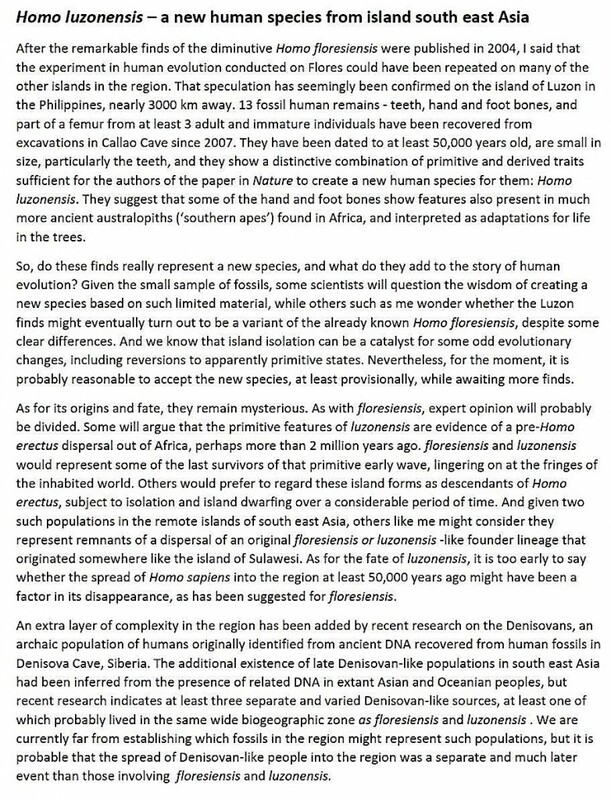 Homo luzonensis and Homo floresiensis were not Homo sapiens. Could we already be collecting information on some beings rather close to what Homo luzonensis and Homo floresiensis are? William Charles Osman Hill, a British anatomist, primatologist, and authority on primate anatomy, published a paper in the journal Loris, in 1945, entitled “Nittaewo – An Unsolved Problem of Ceylon.” He speculated that the traditional Vedda story of Ceylon (today’s Sri Lanka) about the savage, dwarf-like humanoids called Nittaewo, might be an isolated, island species of Homo erectus. 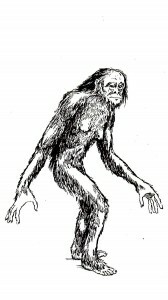 He further related the stories of the well-known small cryptid from the island of Sumatra, the Orang Pendek, to the Nittaewo and Homo erectus, too. 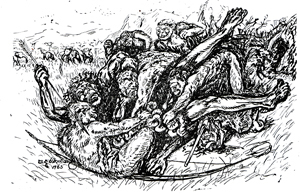 P. E. P. Deraniyagaia’s sketch of Nittaewos eviscerating a fallen Veddah. From Loris, June 1964. 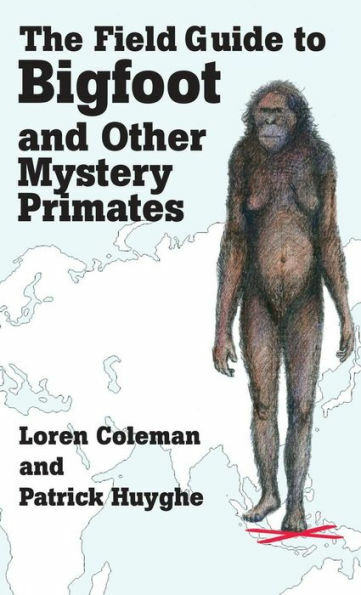 In The Field Guide to Bigfoot, Yeti, and Other Mystery Primates Worldwide (written with Patrick Huyghe in 1999, and revised/republished in 2006 as The Field Guide to Bigfoot and Other Mystery Primates), we picked the Orang Pendek as the “best bet” to be found first. Accounts by indigenous peoples of small, bipedal, hairy hominins have filtered out of South Asia, Southeast Asia, and the islands of the South Pacific for centuries. Since the sighting by Dutch explorer Van Herwaarden in October 1923, on the island of Poleloe Rimau, State of Palemband, Sumatra, reports from Westerners have told of small creatures, “short humans of the forest” covered in chocolate-brown to reddish-brown hair. They are called Orang Pendek, Sedapa, and other local names, including Ebu Gogo on Flores, where the fossils of Homo floresiensis were found. They collectively are what Ivan T. Sanderson, Mark A. Hall, Patrick Huyghe, and I term Proto-Pygmy. 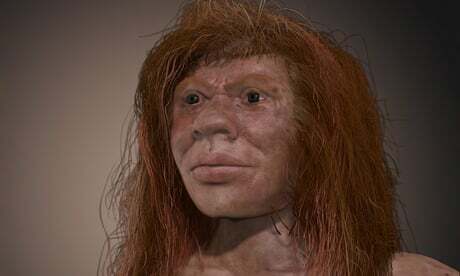 From The-lma to Nittaewo, from Orang-Pendek to Menehune, are islands still occupied by these Proto-Pygmies which are the new species being called Homo luzonensis and Homo floresiensis? 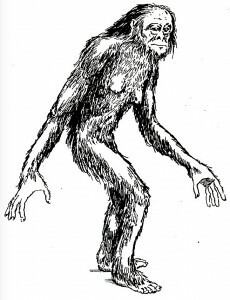 Anthropologists who were open-minded in the 1940s and 1950s about hunting for Yetis felt we might learn something about fossil humans from pursuing cryptid hominins. Then anthropology became convinced the age of discovery was over. It is back and it is time again to search for the hairy unknowns that could inform us in the fields of anthropology, paleoanthropology, and hominology. Hominids are all modern and extinct great apes. Hominins are any species of early human that is more closely related to humans than chimpanzees, including modern humans themselves. At this point, this includes the genuses Homo, Australopithecus, Ardipithecus and Paranthropus. Russian researcher Dmitri Bayanov coined the word “hominology” around 1973, to denote those investigations that study humanity’s as yet-undiscovered near-relatives, including Almas, Yeti, Bigfoot/Sasquatch, and other unknown hominoids. He further defined hominology as a “branch of primatology, called upon to bridge the gap between zoology and anthropology” in a 1973 letter to the London primatologist John Napier. His English paper on the subject was a major breakthrough contribution after decades of unpublicized Russian research and expeditions. The paper, “A Hominologist View from Moscow, USSR,” appeared in Northwest Anthropological Research Notes, (Moscow, Idaho), vol. 11, no. 1, 1977. 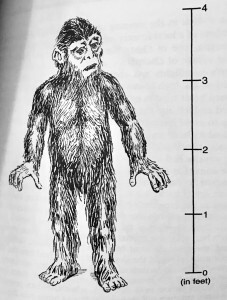 The cover of The Field Guide of Bigfoot and Other Mystery Primates displays a drawing of Ebu Gogo, which may be a modern example of Homo floresiensis.